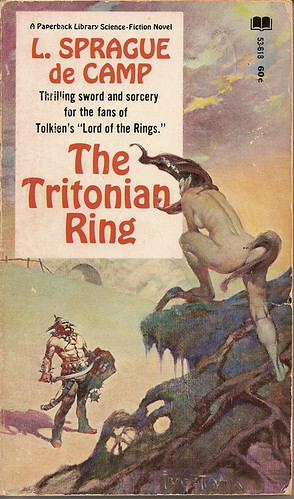 The Tritonian Ring is de Camp’s most highly regarded fantasy novel. It features a remarkable cover by Frank Frazetta that gives him ample opportunity to paint his favorite subject. I haven’t read de Camp’s The Tritonian Ring. Of his work I’ve read a scattering of unremarkable short stories, a terrible and self-important biography of Lovecraft, and a passel of barely passable Conan pastiche. I’ve since acquired his “Planet Krishna” science fantasy series and a few novels here and there. I’ll get to these, but they are nowhere near my “must read” pile on the weakness of my initial samplings.